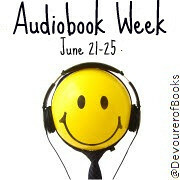 Rounding out Audiobook Week, this is the topic I've been looking forward to all week: favorite audiobooks. These titles are not just books I enjoyed for their stories, but books I enjoyed due to their memorable narrators and otherwise top-notch production. All the Harry Potter books narrated by Jim Dale. Brilliant! I loved Memoirs of a Geisha and Guernsey in print... bet they were great audios. Columbine is on my print wish list, but I'm going over to audible.com now to sample the audio. Thanks for the recommendation! Guernsey is even better on audio, IMO. Columbine's narrator has a very creepy voice. It fits perfectly with the tone of the book. Just don't listen before bed - it will give you nightmares! I stupidly listened to that book only a few days before the school year began last year. That sure made me want to go back in the classroom. I've heard that the Harry Potter audiobooks are amazing... I'm hoping to try one out soon. Fabulous list, thanks for participating this week! The Guernsey Literary and Potato Peel Society is on my short list. I'll probably go ahead and read it before listening to the audiobook. You've listed some of my favorite audiobooks - The Art of Racing In the Rain, The Hunger Games, HP - so you've just given me lots more to add to my "to listen to" list! I'm going to check out Thirteen Reasons Why this afternoon. Thanks!